The Cardinals halted an 11 game win streak for the #24/19 Hokies on Friday in the opening game of the weekend series. The team is now 2-5 in games against ranked opponents this season. However, VT would respond with wins on Saturday and Sunday by a total score of 23-6. The Cards would jump to a 3-0 lead in the opening frame of the game. An error in the bottom of 1st would allow the Hokies to put a run on the board. The contest featured three ties and three lead changes with the teams registering nine hits apiece. Junior Celene Funke’s two-run triple in the top of the 6th pushed the Cards ahead for good, 7-5. Funke leads the nation with nine triples of the season. It also extends her season total to nine, placing her second among Louisville’s single season leaders. She needs one more to tie Audrey Rendon (2005) for first. 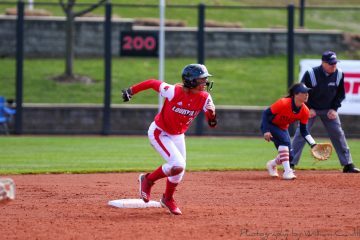 Funke went 2-for-3 with a double and a triple, scored two runs and drove in three runs on the day. Louisville was also led by Melton, who went 2-for-3 with a double, a run and an RBI. Sophomore Danielle Watson (7-8) picked up the win after striking out five and giving up one earned run on two hits. VT would need only 4.5 innings to respond to Friday’s upset from Louisville. They had 2 5-run innings to run rule the Cards in game 2 of the series. 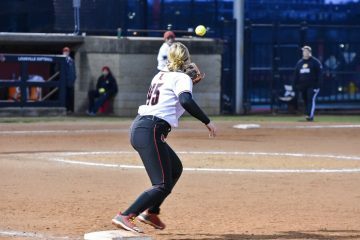 The Hokies used four hits and two errors to put up a five-spot in the second inning and capitalized on four hits and an error to bring the score to 10-1 in the bottom of the fourth. Senior Sidney Melton went 3-for-3 with a double and sophomore Kyra Snyder connected on a home run to lead the Cardinals at the plate. Senior Megan Hensley (9-1) took the loss after giving up five runs, one earned, on five hits in just 1.1 innings of work. Watson made an appearance, and Kyra Snyder also faced 12 batters, giving up 5 runs on 4 hits in 2 innings of work. 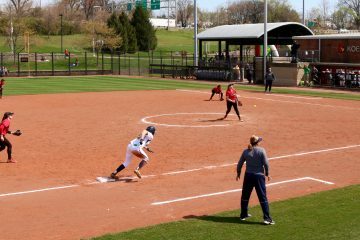 The series between Louisville and Virginia Tech was tied at 7-7 with the loss. The Hokies clinched the weekend series (2-1) and series record (8-7) with their win in game 3 on Sunday afternoon. They got out to a 11-0 lead in 3 innings at the plate. The Cards countered with four runs in the fourth inning. Melton led off the frame with a bunt single, took second on a wild pitch and crossed the plate on a hit by Hensley. Snyder was hit by a pitch to put two runners on for a senior Madison Cousineau’s RBI double. Butler followed with a double of her own to plate Snyder and Cousineau, bringing the score to 11-4. 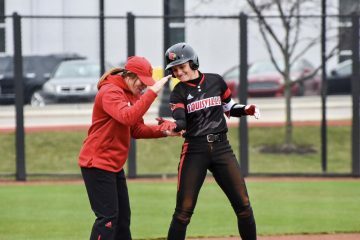 Junior Caitlin Ferguson continued the Cardinals’ offense when she opened the sixth inning by launching her third home run of the season over the left field fence to make it an 11-5 game. Sophomore Danielle Watson (7-9) took the loss, surrendering 13 runs, 11 earned, and striking out five in five innings of work. 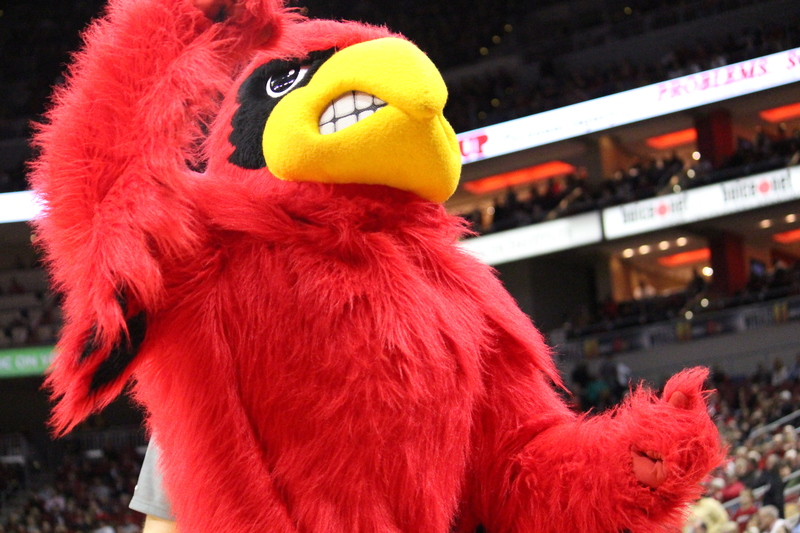 The Cardinals now hold a 22-12, 4-5 ACC record good for second in the ACC standings behind Florida State.